INTRODUCTION TO THE YW PROGRAM:For this portion of the activity, we had divided the main aspects of the YW program up into sections (Personal Progress, Sunday classes, Mutual, Camp, etc) and the Presidency took turns giving a brief explanations of what they are about. 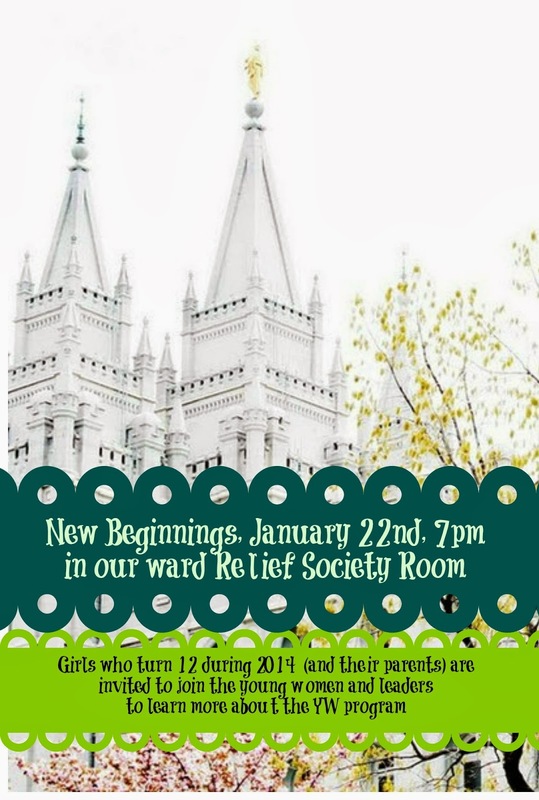 We also pre-arranged for a different YW to come up with us for each explanation and share what their favorite part of (whatever it is) has been. For example, I explained what Mutual is and what kinds of things we do for activities. One of the YW got up with me and told about her favorite Mutual activity from the last year. We did this with every category to give a good overview of the kinds of things they can expect when they start YW. (We had planned this all out at the end of one of our recent Mutual activities). GAME: One of my Counselors came up with a game to get to know the incoming Beehives without embarrassing them. They were each asked to fill out a survey* (ahead of time) and then some of our current YW were asked to represent a specific 11-year old girl in a mock game-show. They even wore over-sized name-tags (with the name of the person they were representing on it). Our Laurel class President tried to guess who each girl was representing based on her answers to the survey questions. It was set up kind of like the dating game – the 3 contestants were separated from the girl asking the question) by a chalkboard. She would ask girl #1, girl #2, and girl #3 the same question (and those yw would answer using the survey answers the 11-year old girls had given). Then when she thought she had enough info, she tried to guess who was who. See photo below. This was a really fun night. #2- What is her favorite food? #3- What is her favorite color? #4- What is her favorite book? #5- What does she like to do for fun? #6- Does she have any siblings? If so, how many? #7- What is she most excited about when it comes to being in the Young Women program at age 12? #8- What is her favorite thing about church?#9- What color is her bedroom? #10- Do she feel comfortable with public speaking (ie, giving talks, etc)?